From left: Dr. Bill Bird, senior vice president for Penn State Health Medical Group; Drs. 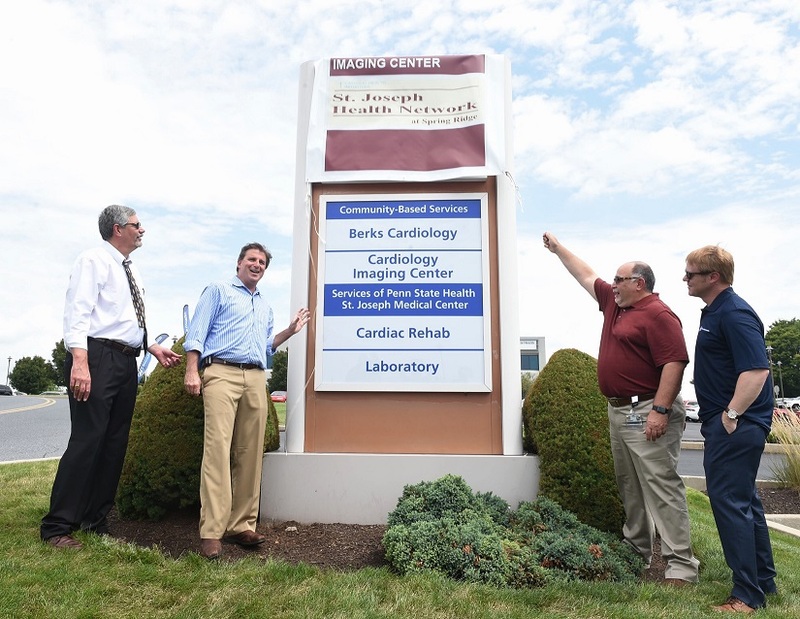 Andy Waxler and Lou Borgatta of Penn State Medical Group - Berks Cardiology; and Dr. Chris Newman, vice president of medical affairs and chief medical officer at Penn State Health St. Joseph, unveil the new sign at Penn State Health Medical Group - Berks Cardiology in Wyomissing. A practice that has served as a leader in cardiac and vascular care in Berks and Schuylkill counties for more than 45 years is now part of Penn State Health Medical Group. An event at Berks Cardiologists, Ltd. in Wyomissing today celebrated its affiliation with Penn State Health and its new name: Penn State Health Medical Group—Berks Cardiology. The practice also serves residents at its Pottsville location. Becoming part of the Penn State Health network allows the practice’s physicians to offer the region’s residents enhanced access to complete, specialized cardiac care close to home, including Penn State Heart and Vascular Institute, the region’s only heart transplant center. Penn State Health will collaborate with the practice to continue to provide the outstanding cardiology services its patients have come to expect, and provide support for and enhanced access to the clinical trials offered through the practice. The agreement between the two organizations was finalized in May and took effect on August 1. It means that the 113 Berks Cardiologists employees, including 13 physicians, are now Penn State Health employees. This affiliation strengthens a relationship Penn State Health St. Joseph and the former Berks Cardiologists have shared for years. All physicians affiliated with Penn State Health Medical Group—Berks Cardiology are also staff cardiologists at Penn State Health St. Joseph Medical Center.